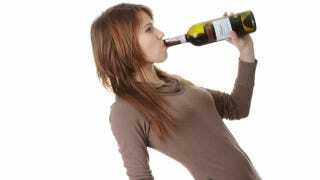 A number of media outlets are reporting on the apparent discovery of an alcoholism gene — a "single fault" in your DNA that supposedly contributes to alcohol dependency. But while this new research is interesting, it's clear that addiction is much more complex than that. There's a gene, called Gabrb1, that appears to regulate the behavior of mice when it comes to their preference for alcohol. When this gene is faulty, it causes excessive drinking. The study, which now appears in Nature, shows that normal mice drink little or no alcohol when offered a free choice between a bottle of water and a bottle of diluted alcohol. But mice, with a genetic mutation to Gabrb1, overwhelmingly preferred booze over water, opting to consume nearly 85% of their daily fluid intake with drinks containing alcohol (at about the strength of wine). The scientists concluded: "Our results provide a new and important link between [Gabrb1] function and increased alcohol consumption that could underlie some forms of alcohol abuse." And indeed, the work does much to show that, in some cases, there may be a genetic link to the overconsumption of alcohol. But a "single fault" for alcoholism? Not so fast. First, we're talking about mice, here. As noted in the study, unlike humans, these rodents don't have a "taste" for alcohol in the first place. As Slate's Daniel Engber has argued, mice are among the most unreliable test subjects, particularly when it comes to approximating human biological processes — and especially ones as complex and multi-faceted as substance abuse. And in fact, the researchers have no idea if this gene has the same effect on humans. Second, the jury is still out on whether GABA mutations, whether they be individual or batched, can reliably predict alcohol abuse in humans. Single genes, mutated or not, cannot possibly regulate the complex behaviors exhibited by people. At best, genetic influences can interact with a confluence of other factors, both biological and environmental. Consequently, it's very difficult, if not impossible, to show how a single "faulty gene" could be associated with excessive drinking. We are continuing our work to establish whether the gene has a similar influence in humans, though we know that in people, alcoholism is much more complicated as environmental factors come into play. But there is the real potential for this to guide development of better treatments for alcoholism in the future. Read the entire study at Nature: "Mutations in the Gabrb1 gene promote alcohol consumption through increased tonic inhibition".